Michaela joined our team in June 2017 and is coming up on her second anniversary with the company. She manages the Horner Park and North Center area for us but has always been willing to lend a hand where we’ve needed her most. Michaela carries a sense of possibility, which I find to be one of her most beautiful qualities. Knowing that our customers are always looking for a better sense of the person who’s working in their home, here’s a deeper look into our dear Michaela. Michaela, we truly couldn’t do it without you! Thank you for all your hard work and dedication. Julia: What are the hardest parts of this job that sometimes takes new employees by surprise? Michaela: I wouldn’t say everyone, but some people may think, “Oh, you’re just walking dogs!” There’s more to it than that. To our customers at Rover-Time, the family pet is just that, family. You’re not just walking a dog, you’re taking care of a member of the family. And it’s important to take this seriously. Julia: You’re such a great example of a strength and perseverance to me. Since coming onboard with us, what challenges did you personally face and how did you keep it all together? Michaela: Throughout my time with Rover-Time I faced some difficulties in my life. I went through a divorce and lost my mother. There came a time that life felt like it was crumbling down on me and wasn’t sure how to keep smiling. With Rover-Time being more than a job, the support and understanding I received from Julia and my coworkers helped tremendously. I don’t know where I would be without their support. Julia: What life habit do you have now that you wish you started much earlier? Michaela: Well, we all mature as we grow older and I suppose I would have been a better at saving money. LOL. But I get the fun of having to teach my kids how important it is to be prepared in life. Julia: What was something you’ve done that made you feel extreme happiness or just brought you a lot of peace? Michaela: Going away into nature. Taking my kids and disappearing into nature for the day, the night, always brought me peace. It’s a great feeling to escape the hussle and bussle of the city and leave reality behind for awhile and hang out in the country. Julia: If you could have one ‘do over’ in your life, what would you do differently? Michaela: I would have accepted more help when I needed it. There was a time in my life when I was determined to do it all on my own. Now I know that it is ok to ask for help from time to time. I’m not a superhero and that’s ok! Julia: What is the most meaningful part of your job here at Rover-Time? Michaela: My clients, my puppies, my teammates, Julia. Rover-Time as a whole is not just a company to work for but a family proud to be a part of. 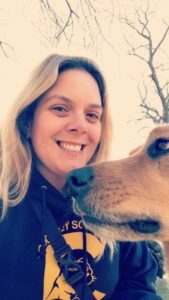 Julia Rohan founded Rover-Time in January of 2012 and received her formal training at FetchFind Academy, a program for aspiring dog trainers, based in Chicago. Julia lives in Irving Park with her husband Mark. Together they co-parent Archer, their 3-year old son, Lou, their 3-month old, and Chauncey Billups Vanderhoff, an over-confident, territorial, and anxious 8lb. Chihuahua-Terrier mix. All the boys do a decent job of melting her heart hourly.